At Our Center, we talk about how we are paving the road to self-sufficiency. Self-sufficiency can look like different things to different people. For some, it involves personal development in the professional sector. Check out a previous post of ours if you are interested in learning about four communication skills that can help you at work. For others, self-sufficiency involves the ability to look beyond your own immediate circumstances in favor of taking in the bigger picture. More specifically, we want to help folks who are in the exciting yet daunting situation of starting a new family. At Our Center, many folks we work with don’t have the resources that many people across the country have taken for granted. What many of us think of as bare essentials might be considered a luxury for new families, often comprised of a single mother and her baby. While that certainly isn’t the case for everyone, we exist to help families who are in need of assistance. When people are faced with the prospect of learning how to take care of another person when they don’t have the support to fully take care of themselves, there is an opportunity there. At the Aspen Center for Child Development of Longmont, we provide Adult Education, Child Education, Childcare, along with Parenting Support and Skill Development. These are practical resources for young parents who are in need of tangible support. But for pretty much any parent who lives in the world of finite resources, we all could use some budgetary advice when it comes to having a new child and all the changes that it brings. 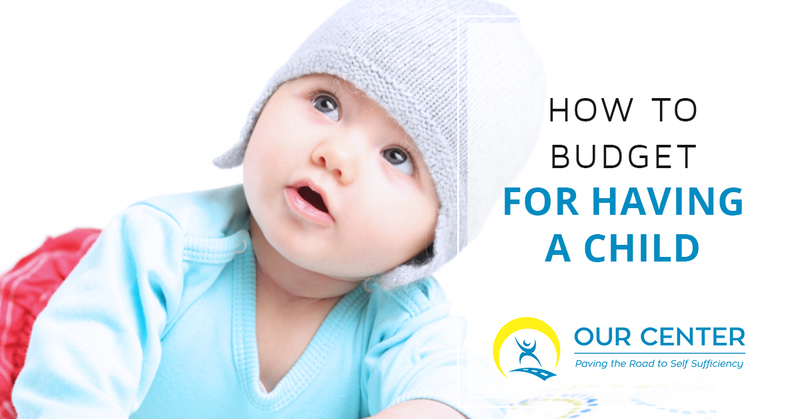 If you are interested in picking up some tips about how to budget for having a child, keep reading! This blog is for you. For an average middle-income family, the cost of raising a child from birth until they are 18 years of age is over $233,000. Making accommodations for housing, and housing in general, takes up nearly 30 percent of that total cost, with food provision accounting for 18 percent. Of course, this figure isn’t even accounting for college education, as that occurs after the age of 18 for most people. Our point is not to overwhelm you, but to help us all understand the big picture. If we can come to terms with the fact that this will not be easy, becoming intentional about how we spend our money is much more easily accomplished. Let’s start with making a post-baby budget. Let’s start with some of the most common top expenses for parents who have newborns. Formula – The monthly cost of formula is anywhere between $70 and $150 per month, assuming that the baby is on a formula-only diet. If the mother and child are able, doing it the old fashioned way for as long as you can is a great way to shave off a few dollars every month. Other ways of saving include moving to powdered formula if you need to use formula. Liquid, ready-to-drink containers might be more convenient, but time is a resource you can spare more easily than money at this point in your life. Further, consider going with store brand or generic formula rather than the more expensive stuff. And make sure you check for coupons on websites and in newspapers! That can really add up in the long-haul. Diapers – Diapers – Diapers can cost around $60 every month, which is $720 on diapers in the first year alone. Whether you shop at the grocery store, online, or somewhere else, going the traditional route of buying disposable diapers is convenient, yes, but ultimately an expense many mothers and fathers aren’t in the time of life to be able to afford. So what is the solution – no diapers? Hardly! Consider going the way that many budget-minded parents are going – the route of cloth diapers. Yes, you will need to wash them. But parents can save thousands of dollars over the course of a few years by going this way. Even if you aren’t on a tight budget, it might be worth consideration due to the expensive nature of disposable diapers alone. Childcare – While many daycares cost north of $1,000 every month, there are other options out there, as difficult of a situation as this one might be. It’s not easy being self-sufficient and responsible. Trying to juggle a professional career with being a full-time parent is not easy, but with resources like our Aspen Child Care Center, we can lessen the burden in a significant way. The Aspen Center is Longmont’s only Level 5 Colorado Shines Learning Program. And if you are reading this wondering that rating means, consider the fact that of the 1,418 day care centers evaluated in Colorado, the Aspen Center for Child Development is one of 15 that received a Level 5 rating. Our programs include STEAM (Science, Technology, Engineering, Arts and Math), an in-house nutrition specialist, a Farm to Preschool program, and much more! If you are interested in enrolling, or even scheduling a tour so you can learn more about our Longmont daycare, we hope that you feel very welcomed to do so. We have a passion for helping families in whatever way we can here at Our Center of Longmont. Other expenses – Obviously, there is more to account for than childcare, diapers, and formula. But we aren’t going to be able to break down every single one of these items for you. However, some potential expenses to be aware of include baby gear (car seats, strollers, cribs, beds) clothes, food, toys, books, and plenty of situations that are unique to your family. We don’t pretend to be able to forecast exactly what is coming, but we want to be able to help you prepare for what many have encountered in the past. If you are expecting and have been avoiding making the tackling of your credit card debt a priority, we need to say two things about this. The first is that we get it. Avoidance and procrastination are natural responses, but, in more ways than one, you can’t afford to let those interest rates eat away at you any longer. Going after credit card debt hard isn’t easy; it requires a budget all of its own in many cases. But it’s necessary because you soon will be facing new expenses. Take a look at your statements and trim the fat as best you can. Pack lunches, drink the lousy coffee at work instead of the $8 daily cappucino you are used to, and go from there. If this sounds overwhelming, we get it. But it’s exponentially wiser to start dealing with a debt situation now, rather than when you are providing and planning for your recently-arrived little one. We want to holistically focus on the whole family, if that sentence makes sense. That means we want to walk with young families in need of support to help them build a happy, healthy family. No two families are alike, so our Longmont family assistance services are flexible. We want to be a helping hand however we are needed. If you are ready to contact our team about family assistance, please do so at your convenience. Likewise, if you are in a position where you can donate to our cause, feel free to do so. Keep in mind that 85 percent of our expenses go directly to participant services, which is pretty special in our opinion!